Nibbler even wears huge bling while riding her skateboard. Nibbler the guard dog has switched to the dark side. Instead acting as a sentinel to protect my roommate's house and all of our belongings, she has turned into a punk like the person who stole Mark's wallet. For no reason and without any prodding through the offering of a treat, Nibbler loves to jump onto the skateboard that's sitting in the dining room. 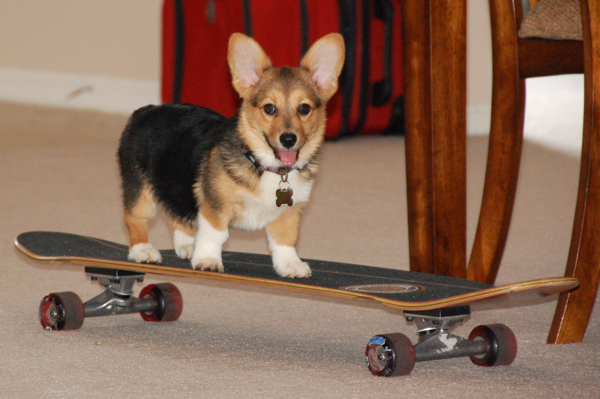 She rides the board onto the table and jumps off, making an annoying thud on the floor when she lands. She does that over and over. The skateboard belongs to my roommate, but he's looking to sell it on eBay. So unless Nibbler comes up with the cash, her toy will be gone soon. Then, I'll worry about her next vice. I just hope it's not marijuana. Such a shameless way to garner multiple hits...put the cute dog up there. She started doing that yesterday as best as I can tell. It might be worth keeping just to entertain her.